The #TenYearChallenge, in which users post a recent photograph of themselves next to one taken 10 years ago, has taken the social networking sites by storm, with even politicians sharing their own versions. Zarif compared an op-ed column written by Bolton 10 years ago about whether it was time for Israel to strike arch enemy, Iran, to his recent comments asking the Pentagon for its plans to do the same. 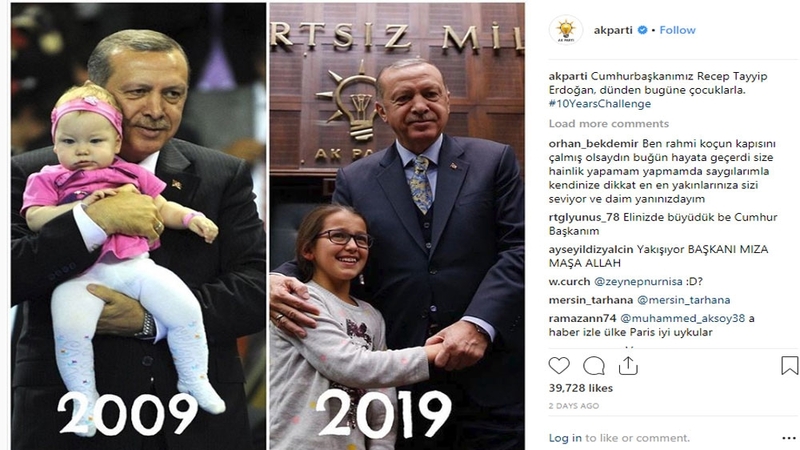 Turkish President Recep Tayyip Erdogan also figured in the social media challenge, with the official account of the ruling Justice and Development Party (AKP) publishing an Instagram photo of him from 2009 carrying a baby girl in his arms after a speech in front of his party’s parliamentary bloc. A 2019 photo next to it shows the Turkish leader next to a school girl in the same place. “President Erdogan from yesterday until today,” says the caption with the post. A pro-Palestinian user responded by posting maps of Palestine before the declaration of Israel’s establishment in 1948 to a map from the present, showing how the Palestinian territory is drastically reduced following Israel’s occupation and expansion. Activists reacted to the ’10 Year Challenge’ to underline its political, economic and even environmental dimensions. A Sudanese activist posted his country’s map in 2009 and compared it with the current map after the secession of South Sudan in 2011. “I don’t think there is a difference that comes close to what happened to Sudan,” the activist wrote. Egypt has been described as an “open-air prison for critics” by Amnesty International with the North Africa Campaigns Director Najia Bounaim saying that under President Abdel Fattah el-Sisi, “Egyptians … are treated as criminals simply for peacefully expressing their opinions”. “This is what wars challenge us to do in 10 years,” the ICRC wrote. Alaa Allagta, a Palestinian cartoonist, drew two pictures of a closed bottle, representing people’s protests rising up under the cork of military rule. In Libya, an activist published a photograph of Colonel Muammar Gaddafi in 2009 wearing a military uniform, next to a picture of retired brigade General Khalifa Haftar wearing the same outfit, alluding to the latter’s desire to occupy Gaddafi’s place despite the 2011 revolution that toppled him. Ten-year challenge memes on climate change were also fairly popular. The SDG Academy, a UN initiative, published two photographs of the Rhone glacier in the Swiss Alps from 2008 and 2018. “Do you know what the real 10-year challenge is? It is climate change,” the account tweeted.